1. 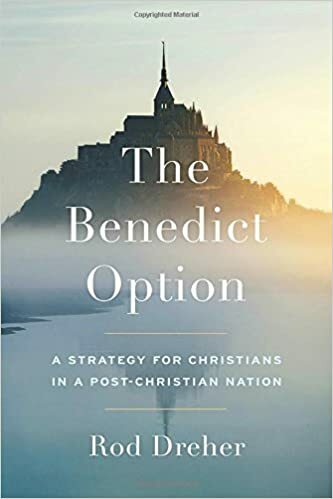 Social hostility and legal restrictions will undermine the viability of many Christian institutions, and significantly limit individual Christians’ participation in many professions and aspects of public life, in the United States within a generation or so. I’ll go back to my premise again. None of what the pundits and prognosticators say really matters. It just doesn’t. And the reason it doesn’t is that real believers live by the Spirit. They operate by the Spirit. They listen to what the Spirit says, and they do it. What swirls around them makes zero difference. Christians today can’t stop looking at the waves. We know how well that worked for Peter. Jesus calls us to look to Him. Period. End of conversation. End of punditry and prognostication. What is the Lord saying to you? Listen and do it. This is the precise ‘formula’ I’ve been advocating and for the same reasons. All this fuss about the future of the Church. It’s only about the future of the institution of church in reality. Do we really believe that God will let the true Bride of Christ fade away? Seriously? God wants to be in a relationship with men and women who will trust and depend on Him and as a result of that trust and relationship, be obedient to what He reveals to them. It’s truly just that simple.. Thanks Dan, the Spirit is speaking in and through you, I have been hearing that same Voice. Stumbled on your blog and love your mind. The book you mention seems to exibit what has been a long standing gimmick in the Christian idea industry. Find a unique angle, package it and mass produce it as the next great mouse trap. I mean, how are you going to sell a million copies if it’s not the most revolutionary essential idea to come along this century? Unfortunatly this is also how cults begin. Yikes. Ron L. Hubbard is famously quoted after failing as a science fiction writer, “I’m gonna start a religion, thats where the money is.” Scientology was born. Thats an exterme example. But may not some small measure of the same dynamic be at work in the latest winds and waves of doctrine that call us to some new movement whose correct implementation would depend on purchasing all the spin off materials of the original best seller? I would exempt Rick Warren. He seems to deserve best sellers and spin offs and we are all better off for them. But theres a lot of wanna be Rick Warrens and a lot of wanna be publishers of the next Rick Warren. Out of that comes a lot of wave surfing.